The weather finally started turning into full on fall weather and it’s made me so happy! I love fall because I can return to eating soup, soup, and more soup. And noodles being in said soup are even better, so on an especially dreary september day, I thought it would be a perfect day for pho. Pho Saigon is one of the newer pho spots in town, having opened some time late last year. It’s one of those big and shiny places where the food comes out super fast, there are flatscreens playing football games, and it’s not very warm and fuzzy inside. I ordered a regular pho with brisket. It was great! I always taste pho broth before I adulterize it with anything (lime, sriracha, etc) to check if it’s good or not. And this broth is great! It’s not too salty, which is typically my number one gripe about bad pho, and it has flavor, because blandness is usually my number two gripe. There weren’t as many noodles, but then again I just ordered a regular and not a large, but man, there was so much meat! 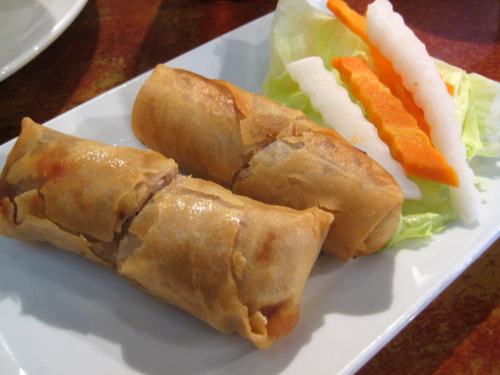 I also ordered some of the fried spring rolls. These were quite disappointing. The inside was just mushy and it had a strange smell. Well, perhaps it wouldn’t be strange to some people, but to me, it just smelled strange and mushroom-ish. And I kept thinking it also smelled slightly like cleaning product, but I couldn’t be sure. It was a bummer. So now you know! Stick to the pho! The other disappointment was that they don’t have pho bo kho on the menu. Pho Saigon is in a terrible strip mall on the corner of Columbus and Washington Ave. There really should be no reason for you to go to this strip mall, unless you need to go to the masquerade costume store or you need to pick out some tile. So if you can’t bring yourself to drive the 6 or 11 blocks down Washington Ave to some of the other pho spots, then this should suit you just fine. Like most pho spots, it’s quite affordable. Just avoid the fried spring rolls! 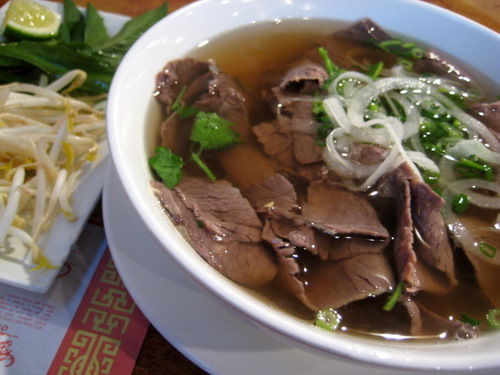 mmm, I have been craving pho but we’re just starting a last hurrah of a heatwave before fall… That sounds so good!